Most Nakba commemoration events this year focused their attention on the 1948 War and the plight of the Palestinian refugees. Rightly so, for that war was in fact the implementation of a Zionist political and military strategy to forcibly remove the majority of Palestine’s indigenous inhabitants to pave the way for the creation of an exclusively Jewish state, creating the largest and longest-standing refugee issue in the world today. In commemoration, and as US President George W. Bush sang his messianic “happy birthday” speech to the Israeli Knesset, 50,000 or so demonstrators calling for the rightful return of the Palestinian refugees crammed into Ramallah’s Manara Square. Just a few meters away from the mass demonstration, where Ramallah ends and the twin city of al-Bireh unnoticeably begins, the Baladna Cultural Center opened its contribution to the Nakba commemoration events: a three-day exhibit entitled From the Scent of Bil’in’s Wall. The exhibit closed on 17 May, and we were the first guests that day. The exhibit is the work of the Bornat family from Bil’in. The main artist is Ibrahim Bornat, a 24-year-old who eagerly greets us at the door of the Baladna Cultural Center. He graciously ushers us into the building, explaining, “eight years ago, at the start of this intifada, I was shot in the leg and shoulder by rubber coated bullets and decided to keep the two bullets as a sort of souvenir.” As the intifada progressed, he was shot at and injured many more times, and so were so many others. “I count 78 injuries in total,” he states, explaining that “one of the more recent injuries is a live bullet that entered my forearm, and another a gas canister that was fired from a distance of about 30 meters and landed in the middle of my forehead, fracturing my skull and causing sporadic memory loss.” The gash in his forearm is hard to look at and the dent in his forehead is hard to miss. Ibrahim’s bullet collection is the main material from which his artwork is created. One of the people injured on the first day of the second intifada was Ibrahim’s 28-year-old brother Rani Burnat. He was shot in the neck with a dum-dum bullet (a kind of bullet that expands in the body once it penetrates the skin, and which is internationally banned according to Declaration III of the 1899 Hague Convention). After six months in a coma, Rani miraculously woke up, but is almost completely paralyzed, retaining only the use of his left arm and his head. He continued his struggle against the occupation by training himself as a photographer. His expressive photographs are scattered throughout the main exhibit. “The only picture I have displayed that Rani did not take himself, is the picture of Rani walking through a line of soldiers on his wheelchair,” Ibrahim says pointing to the first picture we encounter. Four years ago construction began on the Apartheid Wall on the lands of Bil’in, a small Palestinian village of 800 people, cutting the villagers off from 2,300 dunums of their lands (about 58 percent of the village’s original land). Israel has annexed the land for its Modi’in Elite settlement block. 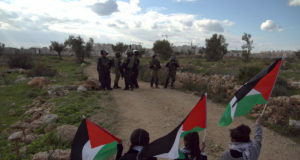 In response, the villagers formed the Popular Committee to Resist the Apartheid Wall which has organized weekly nonviolent actions to stop the construction of the wall since May 2005. 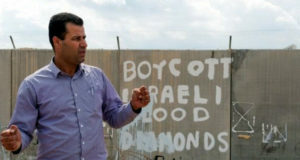 The actions have caught a fair bit of international attention, and the villagers of Bil’in won back 1,100 dunums of their village lands in a September 2007 Israeli high court decision that has yet to be implemented. The demonstrations continue, and are notorious for the Israeli army targeting journalists and internationals, weekly injuries and arrests, and, most relevant to Ibrahim’s exhibit, large amounts of rubber bullets, live ammunition, tear gas, and other Israeli munitions fired onto the protesters. These have become the raw materials of Ibrahim’s art. The way he sees it, “we Palestinians can create life out of their instruments of death,” as he points to a bouquet of dried wheat crowning a gas canister. Although vehicle and body searches are mostly done at random, we wonder how Ibrahim managed to get all of this to al-Bireh/Ramallah. 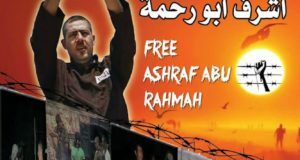 “There are no checkpoints between Bil’in and Ramallah,” he explains, “I’m actually not allowed to go through Israeli checkpoints at any time, with or without my collection because I spent time in jail.” Ibrahim spent 60 days in interrogation at the Moscobiyye or Russian Compound prison in Jerusalem, followed by six months in administrative detention, which entails a renewable six-month prison term without any implementation of the right to know what one has been charged with, or disclosure of any of the evidence against oneself. At any given time, over 1,000 Palestinians are held in administrative detention by Israel. Ibrahim estimates that the first two days of the exhibit attracted around 2,000 people. More guests started pouring in, demanding his attention to ask things like “are you the artist?,” “if I pull the pin out, will this grenade explode?” and “why don’t you melt these and make something out of them?” So we decided to wander around the building with its old stone walls, large halls, and a rooted sense of history, stumbling across the Executive Director’s office. Sawsan Mashni is quick to tell us that she only recently became the director of al-Bireh’s Baladna Cultural Center. Her unripe tenure does not prevent her from knowing the history of the building since, as we soon find out, the story of the building is intricately tied with the life and struggle of the people of al-Bireh/Ramallah. Artist Ibrahim Bornat welcomes his visitors to the Baladna Cultural Center. The building was constructed over a century ago by the Ottoman regime to house the district’s administrative center. After WWI, the British occupation, or “mandate” as it is officially referred to, also used the building as the administrative center for the district. Change came after 1948, when the neighboring kingdom of Trans-Jordan was given control of the West Bank for its collusion with the Zionist leadership during the plunder of Palestine. Al-Bireh and Ramallah were part of Jordan’s reward, and the building was transformed into a secondary school for boys, carrying the name of the Jordanian ruling family. The Hashemite Boys Secondary School (al-Hashimiya) was the only school in the district that offered the scientific stream (‘ilmi), which requires high marks. As such, the school became the place of learning for many of the brightest young men in Ramallah and its surrounding area. As the towns of Ramallah and al-Bireh grew and geographically blended into one another, the location of the school at the meeting point of the two population centers also increased its importance as a community space, with sports fields, and important public buildings like the police station and the land registry included in its direct surroundings, the school became a meeting place for students and non-students alike. With the 1967 Israeli occupation of the West Bank, the act of meeting was politicized, and the centrality of the location meant that the school soon became the de facto launching point for most of the demonstrations and civil actions against the occupation. Israel immediately set about to impose its own educational system on the Palestinians. Students across the 1967 occupied Palestine, al-Hashimiya pupils among those at the forefront, immediately set about protesting the new education system, culminating in a series of student strikes that forced the Israeli department of education in Jerusalem to back down and reinstate the former curriculum. Much of the early resistance to the occupation in the 1967 occupied territories was carried out by grassroots voluntary work committees led by community-based Palestinian municipal councils that operated as alternatives to the various Israeli military and civil authorities. The leaders in the municipal councils were known to be strong sympathizers with the Palestine Liberation Organization (PLO). Abdul Jawad Saleh, the mayor of al-Bireh elected on the eve of the June 1967 war, was prominent among these municipal leaders, and was a leading figurehead in the formation of the Palestinian National Front, a political force that advocated nonviolent resistance to the occupation, and the build-up of Palestinian community capacities by building and protecting schools, libraries, clinics and other social institutions. Israel realized the importance of crushing the organization of Palestinian civil resistance, and targeted the community-based municipal institutions throughout the 1970s. When Israel deported Abdul Jawad Saleh and seven other municipal leaders to Jordan on 10 December 1973 (incidentally, the 25th anniversary of the Universal Declaration of Human Rights commemorated as International Human Rights Day), the response was student riots in the streets, led by the students of al-Hashimiyah. The riots did not bring back the deported leaders, but this would not be the end of Saleh’s involvement in the future of al-Hashimiya. The Israeli campaign against Palestinian civil resistance continued, including the systematic arrest and deportation of popular municipal leaders, the attempt at replacing them with Israeli controlled “village leagues” in the late 1970s, and culminating in simultaneous car-bomb assassination attempts of three Palestinian mayors; Bassam Shaka’a (Nablus) who lost his legs, Karim Khalaf (Ramallah) who lost his right foot, and Ibrahim Tawil (Saleh’s successor in al-Bireh) who received word of the other assassination attempts and narrowly escaped a similar fate. Palestinian civil resistance reemerged in full force with the launch of the 1987 intifada. Recognizing the important role played by al-Hashimiya in Palestinian civil resistance in al-Bireh/Ramallah, Israel relocated al-Hashimiya to a newly built building on a hill in the distant outskirts of Ramallah, alongside the Palestinian Jinan Elementary School. Atop the hill lies the Israeli settlement of Psagot, one of the settlements encircling Jerusalem, and dividing it from Ramallah. “The students knew why their school was being moved, and for a whole year they organized a student strike but were unable to reopen their original school building,” Sawsan tells us. “The new school is a really dangerous place because of the settlement. The hill has many encampments for Israeli tanks which have fired on the school. In 2001, Naser Abid, one of the al-Hashimiya boys, was shot dead by an Israeli sniper while playing in the sports field, another year three children in the elementary school were killed.” Today, visitors of the Jinan Elementary School see a rose garden called Hadiqat al-Shuhahda’ (Garden of the Martyrs) that is tended to exclusively by the school children. The intifada ended with the signing of the Oslo arrangements. One aspect of Oslo, which deferred the status of Jerusalem to fictional final-status talks while Israel consolidated the ring of settlements encircling the Palestinian capital, was to recreate Ramallah/al-Bireh as a Palestinian economic and political center in an attempt to wean the West Bank from the centrality of Jerusalem. One of the many destructive aspects of this has been the tearing down of many of Ramallah and al-Bireh’s historic buildings to make way for expensive office buildings, shopping centers, and apartment blocs. This process of rapid gentrification continues until today. Abdul Jawad Saleh, the former mayor of al-Bireh who was deported in 1973, was able to return to his beloved city as a result of the Oslo process. Recognizing the impending threat on the al-Hashimiya building, he quickly set about to find the funds to renovate the dilapidated building, and together with a group of committed residents, turned it into a thriving cultural center open to all. It was renamed it the Baladna Cultural Center (“baladna” meaning “our country” in Arabic). Over the course of the 1990s, they set up a computer lab, meeting and exhibition spaces, as well as outfitted it with audio-visual equipment for presentations, film screenings and cultural performances. They also set up the Development and Environment Association, partly to push for green community spaces in the concrete jungle that has become Ramallah/al-Bireh. The second intifada began on 28 September 2000, the day that Ariel Sharon, accompanied by hundreds of heavily armed body guards, decided to take an intentionally provocative stroll through Jerusalem’s noble sanctuary, and the day that Rani Bornat was shot in the neck with an illegal dum-dum bullet. The uprising was met with devastating Israeli repression. Sawsan, a social worker at the time, was brought back to al-Hashimiya, now the Baladna Cultural Center, as one of the councilors helping Palestinian children overcome the trauma of the Israeli violence they were being subjected to on a daily basis. This was part of the center’s services to the community. In 2002, the Israeli military imposed a 28-day curfew on Ramallah and al-Bireh, during which time Israeli soldiers entered and ransacked the offices and buildings of all Palestinian civil society institutions in the twin cities. By the end of the siege, very little remained of the Baladna Cultural Center’s contents. As Sawsan tells it, “even the old plaques and trophies that the students of al-Hashimiya had received over a 40 year period, and which had remained in the old building when the school was moved, had been looted.” The team of volunteers picked up the pieces, and reestablished the center, which is now largely self-sufficient thanks to regular membership dues, donations from Ramallah and al-Bireh townsfolk living abroad, and small municipal contributions. Emerging from Sawsan’s office, Ibrahim informs us, “you didn’t see the shop.” He takes us into the room beside that of the exhibit, lined with tables on all sides showcasing Palestinian traditional handcrafts made by Ibrahim’s mother Intisar, and his 17-year-old sister Alaa’. There are traditionally embroidered purses, bookmarks, and bracelets, olive-wood key-chains, as well a CD compilation of Rani’s pictures and olive oil from Bil’in. These items were put together by the family to help cover the financial costs they incurred putting the exhibit together. Hazem Jamjoum is the Media and Information officer of the Badil Center for Palestinian Residency and Refugee Rights and can be reached at mediaenglish A T badil D O T org. All photos by Dina Awad, a Canadian of Palestinian origin who is currently living and working in Ramallah. Ibrahim Bornat can be reached at: bornat_83 A T yahoo D O T com, or by calling +972-598-534-717. The Baladna Cultural Center can be reached at +972-2-295-8434/5.